The final day of the tournament will see Nigeria look to settle scores against Ghana and ensure who will top the final standings. Nigerian skipper Chimezie Onwuzulike continued his wonderful form with the bat in the ICC World Twenty20 Africa Qualifier on Friday to give the home side their third victory of the week at the Tafawa Balewa Square Cricket Oval. Onwuzulike blazed a memorable 90 not out from 70 balls against The Gambia, carrying his bat in the process. He fell just short of what would have been a historic century for Nigeria, but his telling contribution was too much for visitors. Onwuzulike struck eight fours and four sixes in his knock, propelling his side to 144 for three. Ademola Onikoyi chipped in with 21, to give his skipper some support. In response, The Gambians were rolled over for just 56 runs. Andre Jarju scored 22 upfront, but Syvester Okpe blew away the Gambian batting line-up with four wickets for seven runs in a devastating spell. Not to be outdone, Isaac Okpe helped himself to three wickets for six runs to seal an 88-run drubbing. Earlier, table-toppers Ghana saw their match against Sierra Leone abandoned due to persistent rain. The final day of the tournament will see Nigeria look to get one back against Ghana and ensure who will top the final standings. 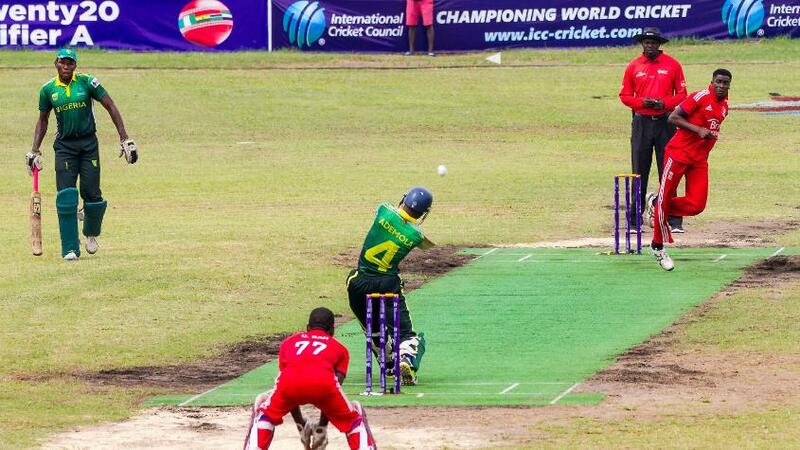 In this morning’s (21 April) fixture, The Gambia won the toss and chose to bat first against Sierra Leone.